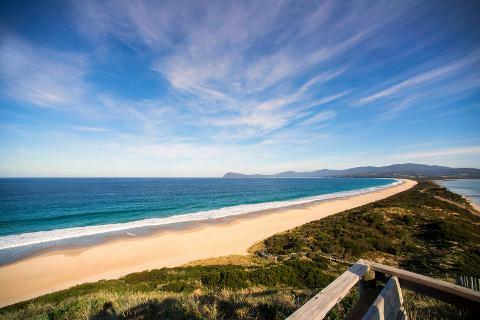 Bruny Island is a small island accessed only by ferry off the south-eastern coast of Tasmania and is home to breathtaking and diverse landscapes, stunning wildlife, an array of foods to delight the palate and delicious single malts to soothe the soul. 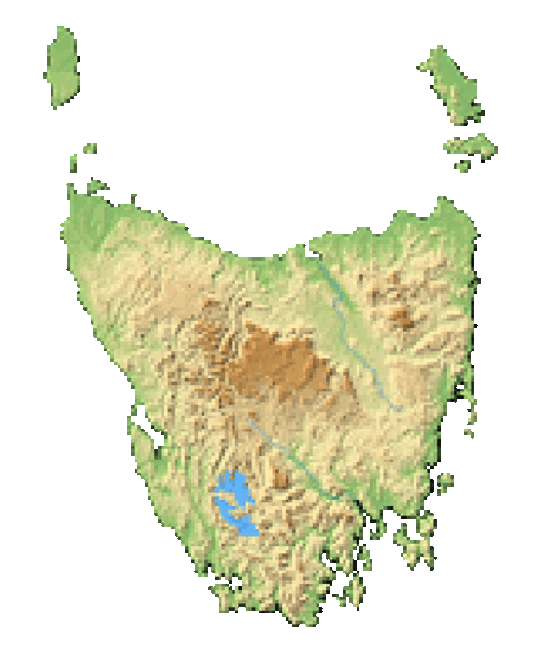 Bruny Island Neck is an isthmus of land connecting north and south Bruny Island, southern Tasmania. 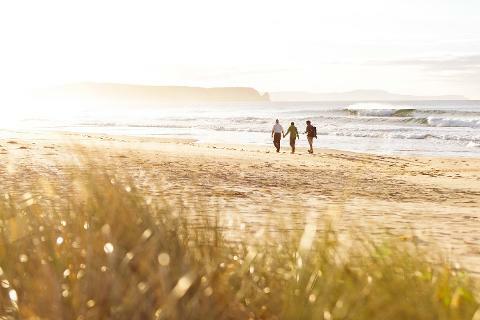 Home to breathtaking and diverse landscapes, stunning wildlife, an array of foods to delight the palate and delicious single malts to soothe the soul, Bruny Island is sure to become a repeat destination for your Australian adventures. Bruny Island, accessed only by ferry off the southeastern coast of Tasmania, Australia, is an adventure in contrast with the state’s open pastures in the north and rainforests in the south. 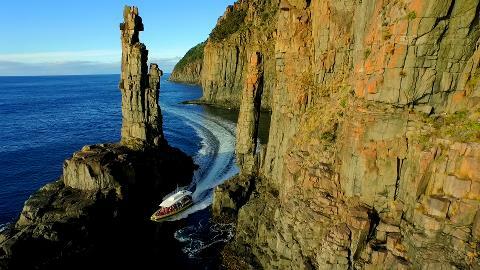 Joined by a narrow isthmus--a term usually exclusive to geography classes--appropriately known as “The Neck”, Bruny Island is Tasmania’s premier island destination, known for its breathtaking views. North Bruny is defined by open pastures and light bushland, while the south is home to the national park and large rainforest areas. Once lit by Australia’s second-oldest lighthouse, a new modern light shines to lead you back to a place that always feels like home. Bring your car with you on The Bruny Island Ferry, The Mirambeena, departing daily from Kettering, a 30-minute drive from Hobart. In spite of visits by British explorers dating back to 1773, Bruny Island is named after Bruni d’Entrecasteaux, a French explorer. The spelling was changed from Bruni to Bruny in 1918. James Cook stayed there for two days in 1777, just long enough to carve his initials in a tree, commemorated by a plaque today. Originally inhabited exclusively by Aborigines, a large community continues to exist. Bruny was originally known as Lunawanna-alonnah, and small settlements are known by their original names today. The island has been used for timber, apple orchards, sheep and cattle grazing since the 1830s. Image thanks to: Julia Smith. 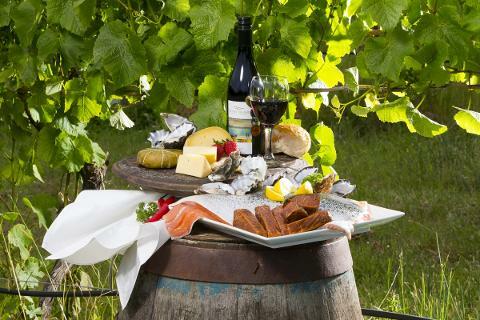 Bruny Island is sure to please your appetite for food and variety. Whether you’d like to celebrate a special occasion on a private retreat overlooking the sea and the mountains, prefer to rough it on a private eco-camping ground, or commune with nature in a wildlife reserve, prepare for personal bliss. 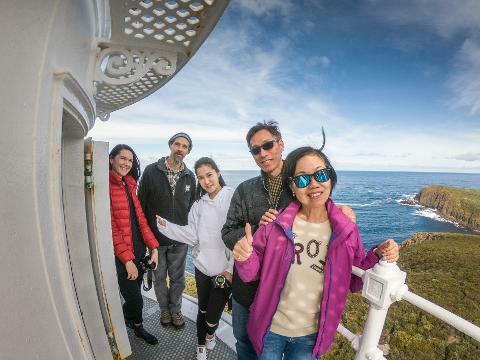 You’ll want to give yourself plenty of time to tour the island--almost 100 kilometers long--to experience the dramatically changing landscapes from the highest tip in the north to the Cape Bruny lighthouse in the south. 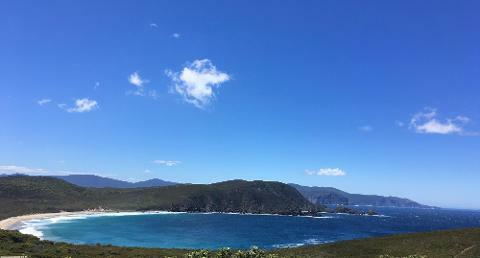 Keep your phone handy for panoramic photos of the Bruny Island coastline and the Tasman Sea from “The Neck”. Tall forests, beaches, farmlands and open bays fulfill all of your Eco desires. Refresh your senses with the smell of eucalyptus and take in the wild coastlines from one of the world’s best eco-cruises from Adventure Bay. Don’t forget to bring your binoculars for some of the most exclusive bird watching in the world. Was that a Forty-spotted Pardalote? It sure was! Once you’ve had your fill of sightseeing, you may satiate your grumbling belly with fresh berries, handmade cheese, fresh oysters, single malts and more. For the undeniable foodie in you, there are multi-day luxury guided tours with food, wine, and, of course, extraordinary views. Is your hunger for adventure stirring yet? Image thanks to:Tourism Tasmania & Craig Parsey. 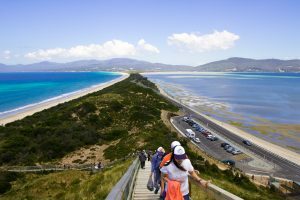 There’s so much to do, see, eat and enjoy in Bruny. We can’t tell you everything, but here’s a little of what you’ll find on this incredible and singular journey to an island that will surprise you and leave you yearning for more. 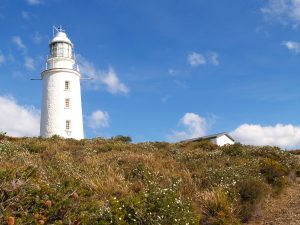 Make your way to the Cape Bruny Lighthouse for a guided tour by people who grew up on the rugged coast and can reveal secrets of the convict-built sight dating back to 1836. You’ll enjoy a 25-minute tour and climb the spiral staircase to the lighthouse balcony for iconic views of the Tasman Sea, South East Cape and Whale Head as your guides share first-hand accounts of stories about the last light keepers of Australia. We can’t promise the whales will reveal themselves, but it’s certainly worth a shot. 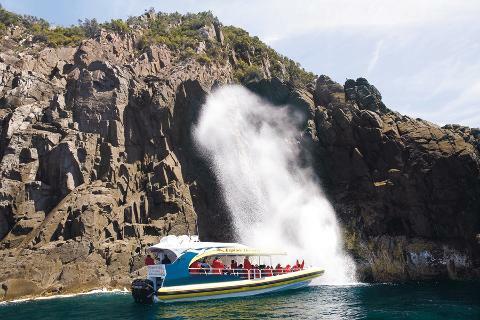 The Bruny Island Cruises have been named among the Top 100 Trips of the World by New York’s Travel & Leisure Magazine. 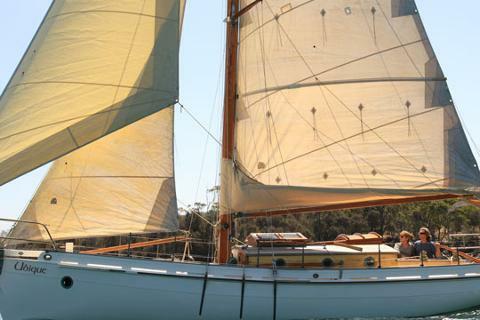 Explore the coastline in custom-built boats and see seals, dolphins, penguins, white wallabies and more. Also, winner of Australia’s Best Tourist Attraction in 2012, 2014 and 2015, the highly trained, mostly local guides will ensure that your incredible encounters with wildlife are breathtaking. It’s your call, but it may be time for a new camera, because your mobile phone captures may not do this scene justice. The Black-faced Cormorant awaits you along with the world’s largest population of the endangered Forty-spotted Pardalote, and up to a third of the world’s population of the Swift Parrot. Bruny isn’t classified by BirdLife International as an “Important Bird Area” for nothing! If you weren’t an ornithologist before, you just may be by the time you leave Bruny. 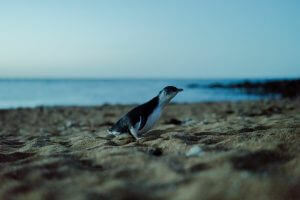 Don’t miss the opportunity to see the smallest penguins in the world, 40 cm in height and weighing in at just a kilogram, with peek viewing from September to February. Be sure to wear dark clothing, as the little fairies are wary. A wildlife guide will be happy to assist you into this world of flightless birds. Bruny Island also has a thriving population of white wallabies, a rare mutation of the Bennett’s wallaby that results in white fur and pink eyes, nose and claws. With no predators of concern on the island, they populate freely. The albino animals live on the south side of Adventure Bay and are most active at dusk and dawn. An early viewing will feel a bit like Neverland as you watch this unique creature in its natural habitat. Image thanks to: Chi Kueng Renault Wong. Manuka honey--one of the most unique and beneficial forms of honey in the world--is known for its healing powers. Tasmanian honey, straight from the hive, is highly prized amongst connoisseurs, regulars and newcomers alike. With about 400 hives on Bruny Island, be sure to put this sweet take-home delight on your to-buy list. After working with cheese enthusiasts around the world, Bruny Island cheese makers settled on the island to make the cheeses you’ll love to eat. With training in France, Italy, Spain and the UK, they believe in old-school cheese making from the days before the advent of modern cheese technology, with a focus on flavour. The island cheeses are made with the ethical treatment of animals in mind to produce the best environmentally sustainable and tasting cheeses in Bruny. There are so many ways to immerse in the magical beauty of Bruny Island. There are island cruises, safaris, nature tours and scenic flights to get your best social media photos. 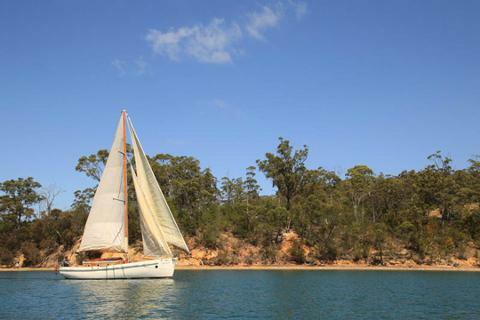 If you’re the brainier type, discover the history of the island that predates the mid-1600's, before it opened up to European settlement when the timber industry took off in the 1800's at the Bligh Museum at Adventure Bay. If you’re an art lover, we welcome you to the art gallery at Dennes Point, featuring the work of local artisans, a unique and imaginative reflection of the environment and culture of the extraordinary and enchanting Bruny Island. Stay in a beachside spa apartment, a historic cottage, a farmhouse or a sanctuary retreat on Adventure Bay. There are tree houses, church houses, campgrounds and island retreats. 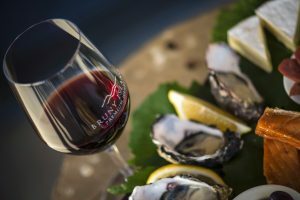 Bruny Island is a retreat that will satisfy almost any palate and a destination adored by all who have the opportunity to live, momentarily, in its magic. 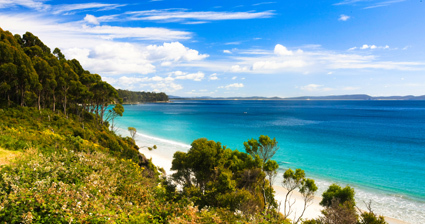 We will visit Bruny Island - home to breathtaking and diverse landscapes, stunning wildlife, an array of foods to delight. These apartments are located throughout the area in Alonnah.